Do you have a minute to spare to learn some English? 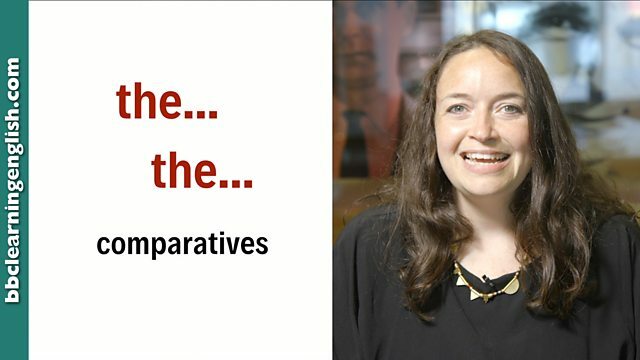 Sam's going to show you the skill of making the.. the.. comparatives! Give us 60 seconds and we'll give you the English! Hello, I'm Sam from BBC Learning English. And today, I have a question for you. If you study more, do you learn more? You could answer this question in two different ways. One: Yes! If I study more, I learn more. Or, two: Yes! The more I study, the more I learn. The meaning is the same. One thing depends on another. But, did you notice? We change the sentence structure. Let's have a look together. Add 'the' to the beginning of both parts of the sentence. Rearrange the order of the words so that the comparatives 'more' - two times here - are after 'the'. The more I study with BBC Learning English, the more I learn. We can use the... the... comparative structures to say that one thing depends on another, or that things change together. The faster you go, the quicker you will arrive. The more he talks, the less I want to listen. We use the + comparative + subject + verb for each half of the expression. Don't forget the comma in between the two clauses. The older I become, the happier I am. The more expensive the gift, the greater the gratitude, I say. Type 1: 'ER' - The faster you go, the quicker you will arrive. Type 2: 'more + adjective' - The more beautiful you are, the more handsome he will need to be. Type 3: 'irregular' - The better the movie, the worse the reviews. For more information about comparatives, click on a picture link above. If I study more, I learn more. Add the to the beginning of both parts of the sentence. What is the structure of a the... the... comparative? There are three comparative types. Can you remember what they are? Which of these comparative types is NOT correct? What is the 'the.. the.. comparative' of: If I run more, I will get fitter.